Chelsea Had a Gluten Free Wedding Cake, but Gina Had a GF Reception! 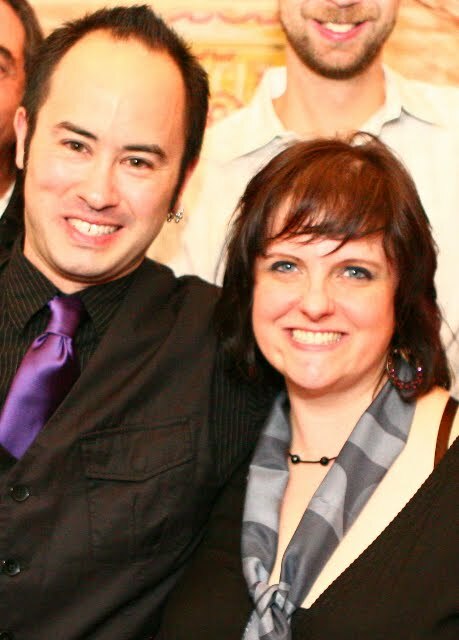 I had the great pleasure of catering a party for a wedding for two of my favorite allergenistas, Gina Klauba and her new husband Jeff Gawel. 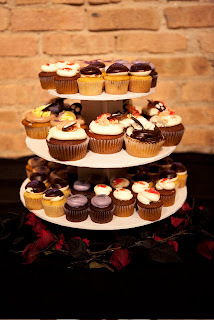 The entire wedding was gluten free and according to Gina, her guests never missed a thing. See some items from the menu and make these recipes for your next party! 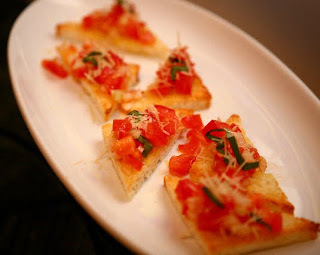 Bruschetta – We used Udi’s Bread for the base, brushed with olive oil and sprinkled with garlic powder, Udi’s was perfect! 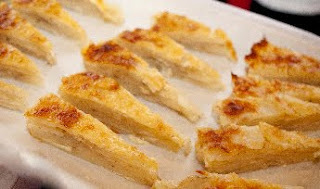 Brush bread with extra virgin olive oil, sprinkle with granulated garlic and bake for 5 minutes on each side. Set aside. In a large bowl, mix all remaining ingredients. Quarter bread slices and spread tomato mixture over bread slices. Heat a large saute pan over medium high heat. Add canola oil and heat another minute. Salt and pepper pork shoulder and put in pan to brown on all sides. Add all other ingredients up to and including chicken stock to crock pot or large stock pot. Add pork shoulder to liquid mixture and add water until pork shoulder is nearly covered. Cook on medium low heat for 4 hours or until meat easily falls apart; use two forks holding them point side down and pull meat apart. Remove pork from juices and cover with barbeque sauce. 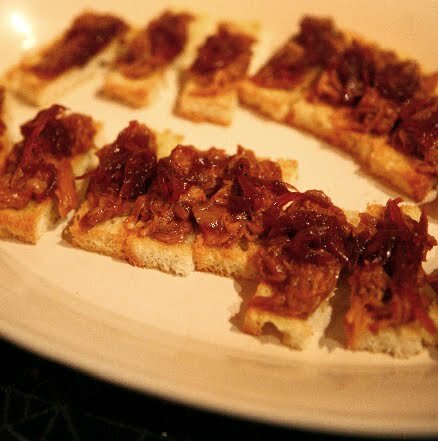 Top on Udi’s bread and garnish with caramelized onion grenadine jam. Heat butter or canola oil over medium heat. Add onions and sweat until soft and translucent. Add sugar, kosher salt and pepper and cook until completely dissolved. Add vinegar, merlot and grenadine. Simmer until onions are glazed with liquid mixture. In a pie tin, rub crushed garlic and butter all around coating thoroughly. Layer potatoes in bottom of pan in spiral formation until bottom is covered. Sprinkle kosher salt, black pepper and gruyere cheese over layer of potatoes and repeat 3 times. Bring cream to a boil in a sauce pan and pour over potato mixture. Cook in oven until you can easily slide knife thru potatoes, if mixture browns on top before potatoes are cooked through, place foil over potatoes to finish. 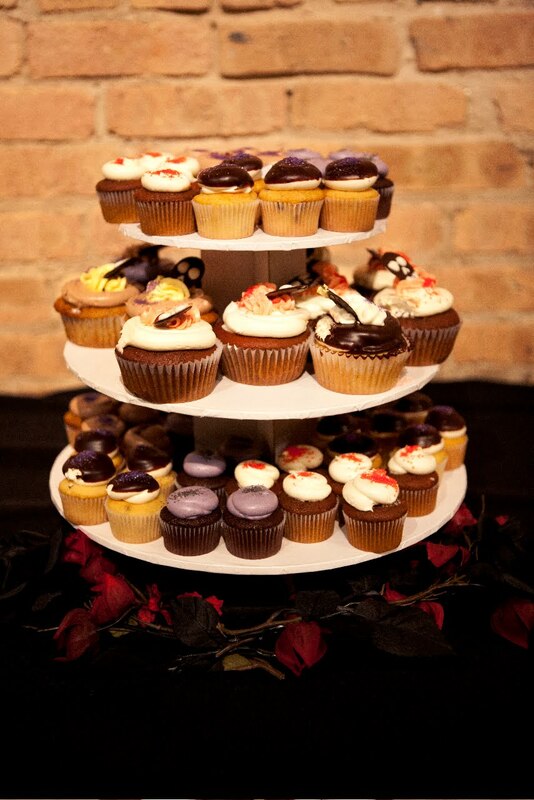 I’d also like to mention the huge Cupcake tower provided by the folks at SWIRLZ Cupcakes was a hit with everyone at the party. Next up: See how we used the crusts from the Udi’s bread we used for the bruschetta, a delicious way to use every part of the loaf! I got a box of samples to try from the folks at Smart Treat and I am so glad they found me. They have some amazing bread products you must try! Smart Treat is manufactured in a dedicated gluten free facility. Most of Smart Treat’s products are also dairy free with many also being free of peanuts and tree nuts, although their plant is not dedicated to be nut free. 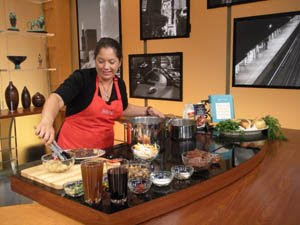 Their recipes are developed by Bonnie in her home kitchen before they are brought to Smart Treat’s master baker, Brian. There are no assembly lines; all products are created in small batches for the freshest quality. I got a loaf of the seeded bread, the onion caraway bread and the cranberry walnut bread. 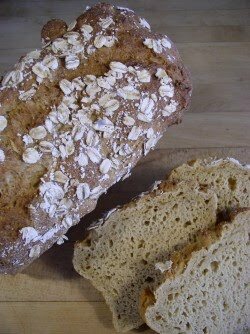 This bread has an amazing taste and texture; I toasted this bread and ate it with a little Smart Balance with no other “doctoring” necessary. We especially enjoyed the onion caraway bread, truly outstanding! Another thing I like about Smart Treat is that their loaves are reasonably priced and if you buy $40 worth of product, shipping is also free. I can’t wait to try their dinner rolls and brownies! When you order, tell them I sent you… Enjoy! Hey allergenistas! It has been a crazy month, I apologize for the lack of posts, but I have so much to share: new restaurants, new products and some great recipes, so keep posted! 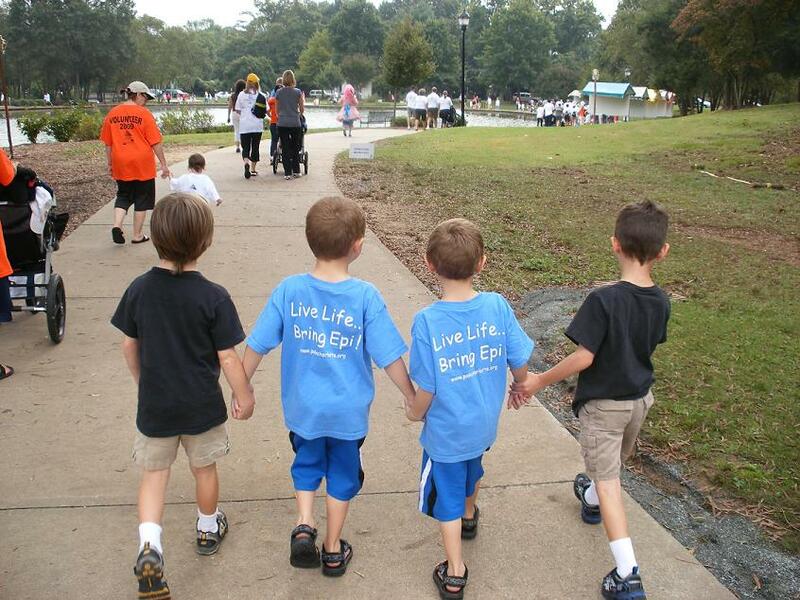 First up, this Sunday is the Food Allergy and Anaphylaxis Network’s Walk for Food Allergies. It’s so fun to see the teams supporting their loved ones with food allergies. Some teams to look out for are the Non-Dairies, Angie’s Peanut Busters and Fans of Finn. This year FAAN is hoping to raise $140,000 to continue their work toward curing food allergies. This year’s walk has the pleasure of Cybele Pascal (author of The Allergen-Free Baker's Handbook) and Kelly Rudnicki, (author of The Food Allergy Mama’s Baking Book), available at the 2010 Walk for Food Allergy in Chicago to sign your books, not to mention the tables of vendors with safe food for your family to try. It’s really a fun event where you can make a difference in your family and millions of others that suffer with food allergies. You might even see Trace Adkins there! I recently wrote an article for the FAAN newsletter to help newly diagnosed allergenistas navigate their way through the maze of substitutions and rethinking on their new lifestyle, to read it click here. I really try to think of my food allergies as a blessing of revitalized health and an opportunity to try new foods that I wouldn’t have pre-allergens. It has been an exciting and challenging road and I am happy to share all that I learned with you.